Download "I've Loved These Days"
(Recorded July 1980, Horizon, Chicago, IL, Turnstiles) Hello Jimmy Carter, Goodbye Gasoline. It was fun growing up in the great spoiled bratdom of America. Hello Ronnie Reagan, El Salvador, here we come! 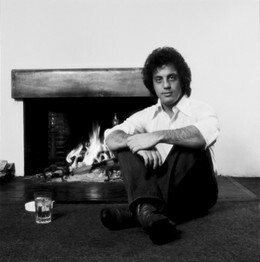 Billy Joel (1976). Photo by Michael Putland. This is the audio to "I've Loved These Days" (live). For the original studio version from Turnstiles (1976) and a homemade video, click here. "So before we end and then begin, we'll drink a toast to how it's been . . . " (Inside cover art from the LP).